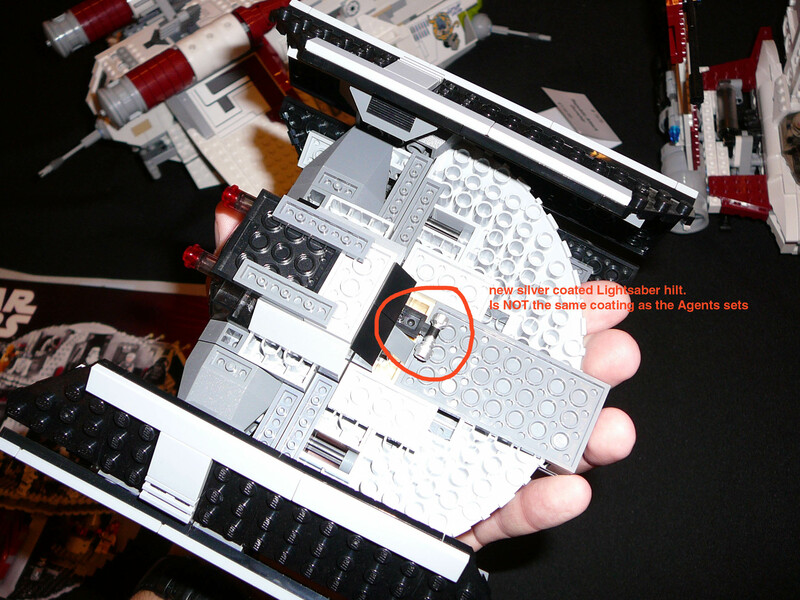 During LEGOWORLD 2008, two weeks ago, I had the opportunity to have a good look at the new 8017 TIE Advanced set, foreseen for the second half of 2009. This is all very cool. I'll be the first to admit that I did see photos on a certain site of this, but I didn't see the new lightsaber hilt. That'll be interesting to see when it comes out. I'm really excited about this set, especially since the x1 is my favourite Star Wars ship out there. Apparently the cost of producing a chromed brick is 30 times more than a standard one. Anyway this is great news. yeah Rayman, im really not looking forward to seeing the price tag on this one...its gna hurt. Interesting. Though to me, the chrome hilt looks like it was cheaply painted on and will peal off very easly. But it is Lego, they aren't THAT cheap. Oh wow, great find. Good to know we'll be back to chrome hilts. And there it is: my Father's Day gift! Father's Day? I don't know where you're located, but Father's Day is in June in the US. How can you wait until June for that set? I know I won't. I'm sure you can see my point though. June is a long time from now and I don't want to wait that long to get the new Vader TIE. I will definitely be getting 2 of this thing. My son has been complaining for awhile now that he didn't get a Vader TIE so this will be exciting. Excellent. The return of the chrome lightsaber is great news. I'm looking forward to Vader's TIE Advanced. I have the Tie Collection so it will be interesting to see what changes Lego have made to Vader's own. Obviously it's a different colour now. It looks great! The color looks a lot better than the blue used in all other TIE sets. Pity that Lego didn't choose this color scheme for the previous TIE sets (Apart from UCS TIE Advanced). Aesthetically pleasing. Nice one LEGO! I like the new changes and I'm looking forward to this set! The use of the new slopes and large round plates really enhance the look of the TIE advanced and bring it closer to the movie model. Hopefully we'll get the new printed Darth from the 10188 DS. Chrome lightsaber hilts are still in a few sets, so why do folks think they have disappeared? But I picked this set up today at Toys R Us. The chrome lightsaber hilt is the same type of silver paint on the IG-88 figure from 6209 Boba Fett's Slave 1. So it's not really chrome. I have to admit that I'm a bit disappointed. But it's a great new design of the TIE set with better changes since the last TIE advanced. I'm working on a review as I type this. EDIT: Here is the review of the set. I got the set delivered today. I love the Anniversary Box! But unfortunately no Chrome Vader included (bought the Set via Bricklink in USA, so I had some hopes).